Nikki Roberts feels very grown up when her parents leave her alone in their mountain lodge for a few days. The 13-year-old has promised them she will not take any long horseback rides or canoe trips, so she saddles Goblin and heads for a nearby sheep meadow for the afternoon. It's not long before Nikki's trail leads her into perilous territory. She surprises deadly poachers at work who are shooting bighorn rams for trophies. Her CB radio picks up a distress call from two children stranded in a forest fire that has broken out down river. Can Nikki rescue the children and avoid the dangerous poachers? 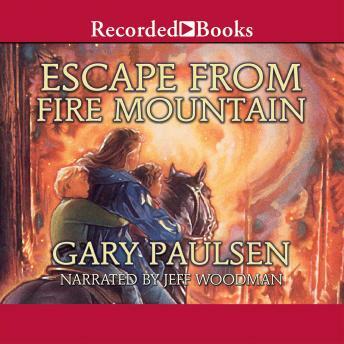 Gary Paulsen is a three-time Newbery Honor Book author. His World of Adventure Books capture the spirit of discovery and excitement found in our country's majestic landscapes. In addition to non-stop action, Escape from Fire Mountain also includes valuable information about forest fire survival.